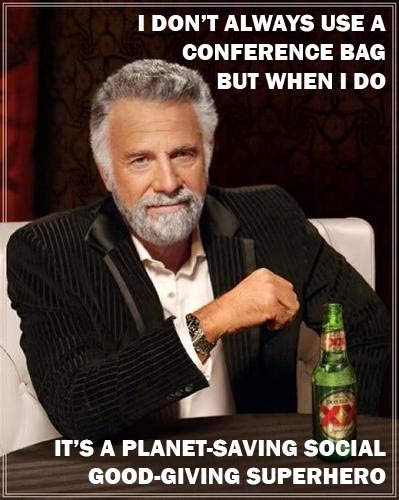 Is your conference bag a repository for notebooks and sponsor flyers? Or it is a planet-saving, social good-providing super hero? Up-cycled conference bags have become an increasing trend in the meetings industry. Keep your event banners, hand them over to a social enterprise to repurpose into a bag, and then give or resell them as branded items to customers or attendees. I recently came across Common Thread, one group that is harnessing the desire of event planners to do good, reduce waste and provide conference bags that are more than just a container for exhibitor materials. Melanie Conn took some time to share the story of their program, the difference it makes and some tips for event professionals looking to up-cycle banners to bags. Common Thread Co-op is based in Vancouver, Canada. 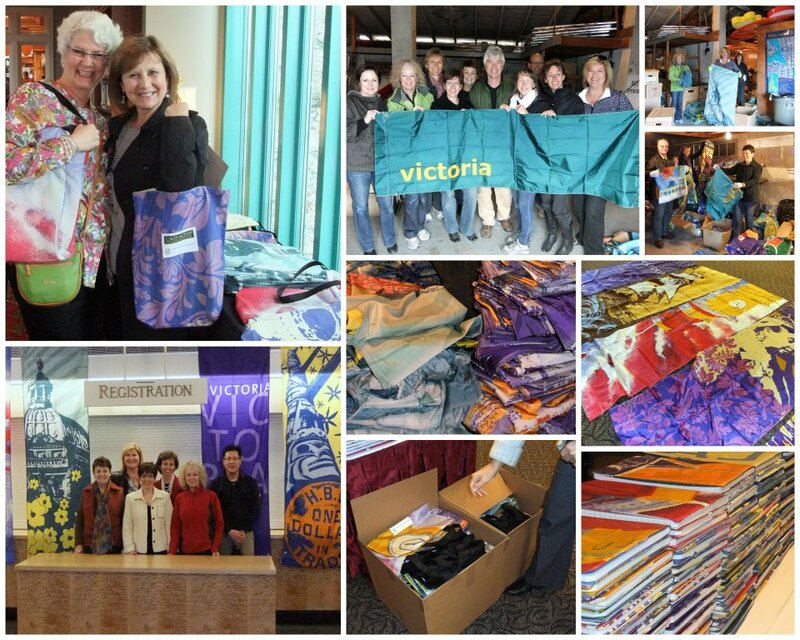 Since starting up in 2009 they have up-cycled thousands of street banners into conference bags and other products, such as lunch bags and notebook covers. The Co-op’s producers are all women who are newcomers to Canada or living with other barriers to employment. In partnership with the Kettle Friendship Society, the Co-op trains new producers to ensure high quality sewing and better opportunities for these women. Common Thread has repurposed over 5600 nylon banners into bags over the last two years, reducing landfill by 1.4 metric tons and avoiding 55 metric tons of carbon dioxide emissions. Canadian Association of Gift Planners event attendees select their own conference bags and notebooks. Conn is always searching for street banners to replenish Common Thread’s inventory, which most commonly uses flag-type fabric. Banners made of this material are often donated from municipalities, events like the Celebration of Light and institutions like the Vancouver Aquarium. These materials may be donated, or provided with the intention of buying bags back. Banners are also provided through The Flag Shop/TextileImage, who encourages their customers to donate or repurpose materials purchased from the company. Common Thread is also provided with a production corner and a micro retail outlet at The Flag Shop. It is here that specially trained producers cut, sew, customize, brand, quality-check and ultimately pack and deliver bags. Conn is careful to point out the challenges of working with vinyl, arguably the most prevalent event banner substrate in use. Because it is heavier, and often provided in larger quantities, planners should not be surprised if banner up-cyclers like Common Thread ask a few questions before encouraging you to donate vinyl or other banners. (In my experience any reputable banner repurposing program will ask you questions about your material to ensure usefulness before taking them. Event planners are also encouraged to ask graphics producers for alternatives to vinyl if they want to reduce both manufacturing and disposal impacts). If you’re interested in receiving more information about Common Thread or want to buy bags you can contact Melanie Conn through their website at www.commonthreadcoop.ca.